My friend and colleague Chris Baker, author of several guidebooks for Moon and other publishers, has recently noted that Argentina, Bolivia and Cuba have recently collaborated to create a route called "Los Caminos del Che," to follow the travels of the legendary Argentine born revolutionary Ernesto Guevara. 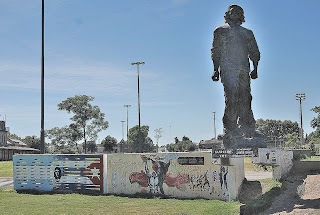 While my first-hand knowledge of Cuba is nil and I’ve spent only a limited time in Bolivia (and none in the area where Che met his fate), I’ve written about his Argentine youth in the course of my own travels in the country, and have visited several Argentine sites recently. 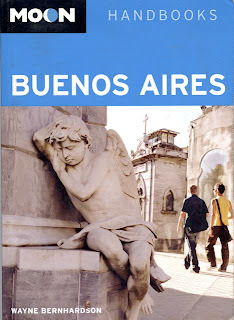 Argentina’s portion of the Guevara saga, created under the auspices of the Secretaría de Turismo de la Nación, includes destinations including his birthplace city of Rosario, the northeastern Misiones province town of Colonia Caraguatay, the city of Córdoba (capital of its namesake province) and the nearby town of Alta Gracia, and the Patagonian resort town of San Martín de los Andes. Guevara always was always more than a little mysterious, and the mystery started with his origins. According to biographer Jon Lee Anderson, Che’s registered birthdate of June 14, 1928, was a deception, as he had been born a month earlier - his mother, Celia de la Serna, was pregnant at the time of her marriage and Che’s father Ernesto Guevara Lynch moved them immediately to remote Misiones, where the pregnancy could be kept secret. 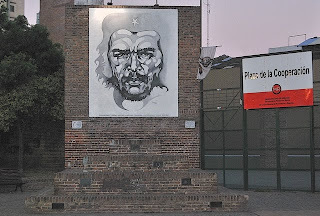 In reality, Che’s presence in Rosario was fleeting - the Guevaras returned to Caraguatay after a brief visit to family in Buenos Aires - but that doesn’t mean it’s gone unnoted. His Rosario residence, a handsome apartment building at Entre Ríos 480, has long been a minor pilgrimage site, and the Plaza de la Cooperación (pictured above), two blocks northwest, features a scowling portrait on a brick wall. 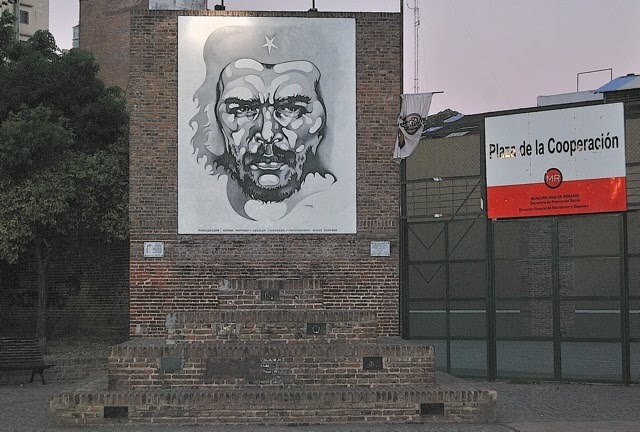 Most recently, in 2008, Argentine and Cuban architects collaborated to create the Plaza Ernesto Che Guevara (pictured here), a drab open space with an equally undistinguished statue. In fact, rather than Rosario, Che-chasers would be better advised to go to Córdoba, where young Ernesto went to school, and Alta Gracia, where his parents moved for the dry, mild climate that would be easier on his chronic asthma. Normally he made the 35-km commute by local bus but, for a time, he boarded in an annex of the Colegio Deán Funes (which no longer occupies its original downtown site). 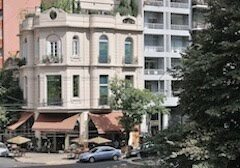 That annex is now the Azur Real Hotel Boutique, the city’s first hotel of its type, and probably the only Argentine hotel that can say “Che Guevara slept here” - on his travels in Patagonia and elsewhere, Che normally crashed wherever he could without paying. Visitors will learn more about Che by going to Alta Gracia, a charming colonial town that’s home to the Museo Ernesto Che Guevara, which occupies one of several houses that the Guevara family rented in town. Then known as Villa Nydia, it’s the least polemical of any Guevara memorial. 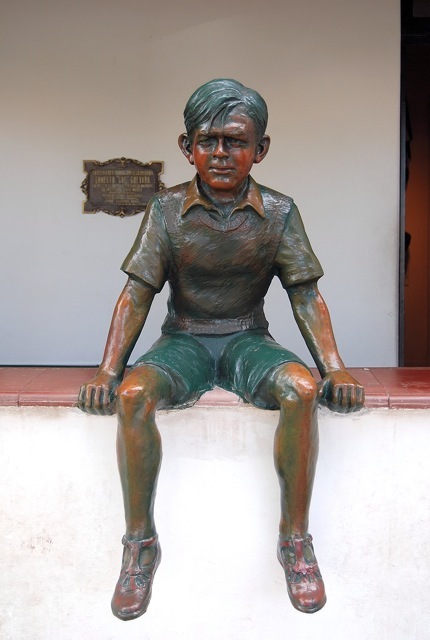 In fact, it does such a good job of reconstructing Che’s boyhood - through a photographic history of Ernesto and his family, his school report cards, and memories by his classmates, cook Rosario González (whom I met briefly several years ago), and others - that it doesn’t really place it in any greater context. This may not be the place for a full biography but, from its contents, one would hardly know that Che was a controversial figure, nor have any idea why Villa Nydia was converted into a museum, nor why so many neighbors opposed the conversion - nor even why Fidel Castro and Venezuela’s leftist president Hugo Chávez visited in 2006. Alta Gracia’s prize exhibits include a bicycle and a motorcycle of the same models that the youthful Che used in his trips around South America. 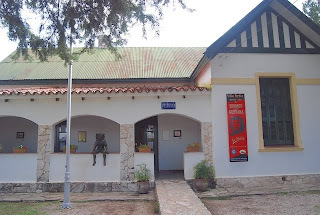 Part of that history is covered in San Martín’s Museo La Pastera Che Guevara, which I covered in detail in another post a little over a year ago. Anyone who wants to follow Che’s South American travels, though, would be better off picking up Patrick Symmes’s Chasing Che, which tells of the author’s adventures in search of the Guevara legend in 1996 (when I met him on Chile’s Carretera Austral). Today is the 200th anniversary of Argentina’s Revolución de Mayo, which started the country’s independence movement, and bicentennial celebrations are underway in Buenos Aires and throughout the country. Half a dozen mountaineers from the city of Mendoza, though, have chosen a unique way to celebrate the bicentennial: a late autumn (early winter, really) assault on the 6,962-meter summit of Cerro Aconcagua, the “Roof of the Americas,” the western hemisphere’s highest peak (pictured above, in summer). It didn’t go exactly as they expected, though. 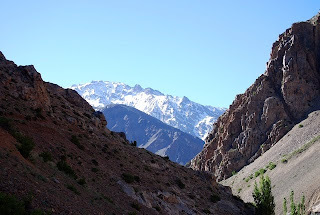 As the southern hemisphere winter approaches, climbing Aconcagua is a risky adventure even though, by the normal route via the base camp at Plaza de Mulas, it’s a walkup that doesn’t require any special technical climbing skills. Pacific storms drop most of their precipitation on the Chilean side - the province of Mendoza lies in the rain shadow of the Andean range - but that doesn’t mean much in Aconcagua’s case. At that altitude, there’s nothing to stop the wild westerly winds that blow the snow around even when it’s not actually snowing - visibility is limited and temperatures are dangerously cold. When it’s snowing, as it has been today, it’s even dangerous. That’s why, given the conditions, the group from the Club Andinista Mendoza chose yesterday, the 24th, to attempt the summit - the weather forecast for today was simply too risky. According to the Mendoza daily Diario Uno, the only climber to reach the summit, 35-year-old Luciano Badino, planted an Argentine flag on the peak in commemoration of the bicentennial at 1:30 p.m. Even taking advantage of a window in the weather, he did so in temperatures that reached 40° C (also 40° F) below zero. Meanwhile, as the climbers descend to the highway that connects Argentina with Chile via the Paso Internacional Los Libertadores, the accumulating snow is a reminder that, soon enough, the southern hemisphere ski season will begin. While the border is open despite occasional backups - yesterday also marked the end of a three-day holiday weekend for Chileans, many of whom traveled into Argentina - the area should soon get crowded with skiers. Just over the border, Chile’s Portillo is one of South America’s top ski resorts; normally, because of the rain shadow effect, Mendoza’s Los Penitentes doesn’t get the same accumulation of snow, but the early indicators are encouraging. There are, of course, many other elite ski areas in the region, such as Argentina’s Las Leñas, Cerro Chapelco, and Cerro Catedral, and Chile’s Valle Nevado and Nevados de Chillán. As the season advances, look for more information here. Throughout the world, large parts of thinly populated deserts are often sacrifice areas for mining, grazing, and other environmentally destructive activities that have damaged their natural and cultural heritage. Northern Chile’s Atacama desert is no exception but, for the last two years, there’s been a new menace: relocated from Africa, the world-famous Dakar Rally has torn through fragile archaeological sites in both 2009 and 2010, and will get the chance to do so again in 2011. 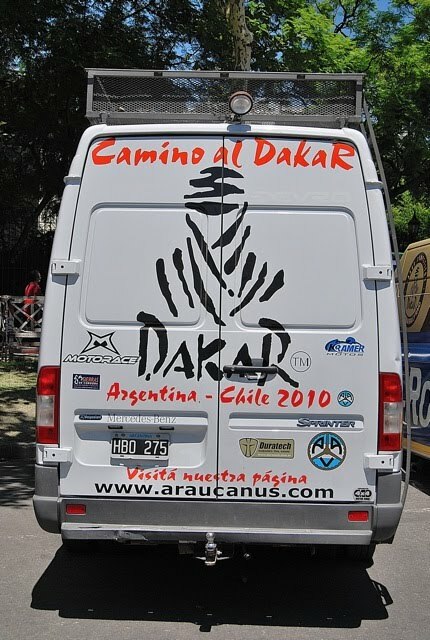 Starting in Buenos Aires, Dakar thunders across the Pampas and through the Atacama before returning to Argentina. Dakar 2010 claimed fewer lives (one) than in 2009 (three), but it did far more damage to sensitive archaeological sites - according to Chile’s Consejo de Monumentos Nacionales (National Monuments Council), the country’s Instituto Nacional de Deporte (National Sports Institute, which sponsored the Dakar invasion) is liable for US$570,000 in fines for damages to 56 archaeological sites in the Atacama region of Antofagasta, near the riverside oasis of Quillagua. The disrupted sites included lithic workshops, where pre-Columbian indigenes carved arrow and spear points, as well as Inka roads and trails. In the previous year, the IND paid only US$75,500 in fines. Nevertheless, the cultural and environmental demolition derby will go ahead in 2011 because, like mining and grazing, it’s profitable. 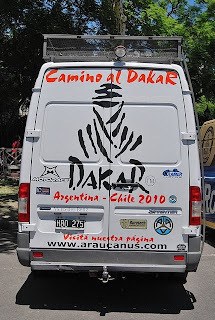 According to the Argentine government - not, admittedly, the most reliable source for statistics - Dakar 2010 drew four million spectators and generated US$160 million in revenue. Even if those figures are a fraction of that, half a million dollars is merely chump change for an institution like Dakar - even though the Atacama’s archaeological heritage is priceless and irreplaceable. In the past several days, there’s been news of two developments that could simplify and encourage travel between the United States and the Southern Cone countries of Argentina, Brazil, and Chile. One of them has immediate regional significance, while the other - a longer-term change that’s still speculative to a degree - is more far-reaching and even revolutionary, though it has complex implications. 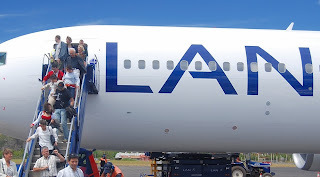 In the first instance, LAN Perú, an affiliate of Chile’s LAN Airlines, is instituting four flights weekly from San Francisco International Airport (SFO) to Lima’s Aeropuerto Internacional Jorge Chávez (LIM), from July 1st. LAN’s fourth link to the United States - it also serves Miami, New York and Los Angeles - will offer the only non-stop flights from SFO to South America, but Perú is not the only attraction. For Bay Area travelers bound for Buenos Aires, Santiago or São Paulo, Lima’s efficient new airport will offer easier connections than mega-airports such as Los Angeles (LAX) Dallas Fort Worth (DFW), and Houston (IAH). Besides avoiding US domestic flights, with possible long layovers, the SFO connection will mean that travelers will be able to settle into their seats immediately for the long haul to Lima. The only negative is that the 1:15 p.m. departure time from San Francisco means a midnight arrival for changing planes in Lima, but the connection should be quick and efficient (I have made this transfer several times en route to Buenos Aires and Santiago from Los Angeles, and far prefer it to going through Dallas or Houston). The other development is far more significant than the addition of another city to LAN’s North American gateways. According to the online Santiago Times, the United States is considering the inclusion of Argentina, Brazil and Chile in the Visa Waiver Program, which would allow citizens of those countries to travel to the US for up to 90 days without obtaining a tourist visa. This is a sore point in all three countries, which have instituted “reciprocity fees” in retaliation for the current US requirements that all their citizens obtain advance visas, which incur high per person costs and additional travel to capital cities for in-person interviews. With inclusion in the Visa Waiver Program, presumably, the three countries would eliminate such fees, which actively discourage travel to South America. Most of the countries currently in the Visa Waiver Program are from Western Europe, along with Canada, Australia, New Zealand, South Korea and Singapore. According to Roger Dow, of the US Travel Association, the Southern Cone countries could participate within 26 months - not soon enough, in my opinion, but a big improvement over the current situation. Increased travel between North and South America would be a win-win for all four countries. In a little over a week, Argentina will begin celebrate the bicentennial of the Revolución de Mayo, the 1810 uprising against the Spanish Crown that resulted, six years later, in a formal declaration of independence at the northwestern city of San Miguel de Tucumán. Starting next week, the city of Buenos Aires - where the revolution started - will be host to a series of commemorative events, including the reopening of the emblematic Teatro Colón on the 24th. Likewise, Chile is celebrating its bicentennial this year, though the main celebrations will take place during mid-September’s Fiestas Patrias - when Chileans celebrate their own independence day on September 18, In reality, it’s really a week-long celebration that fills even the streets of Santiago with huasos (Chile’s approximate counterpart to the gaucho) in the saddle, couples dancing the cueca, and fondas (street food stands) that offer traditional food and refreshments. Like Argentina, Chile actually had to wait years for an official declaration of independence, which took place February 12, 1818. Only a couple days after Argentina’s actual independence day - that bicentennial will have to wait until July 9, 2016 - southernmost Patagonia will experience a full solar eclipse. On July 11th, the eclipse will trace a route across the South Pacific Ocean (image above, courtesy of NASA), also making landfalls at the Cook Islands and Easter Island. As it crosses into southern Chile and Argentina’s Santa Cruz province, it will still be daylight but in the southern hemisphere the winter sunset will be approaching. Eclipse chasers, then, have had two options to choose from but, because it’s winter, the weather could be iffy at both locations. Five hours west of Santiago by air, Easter Island has a subtropical maritime climate, so the weather should be mild (around 18° C or 64° F), but most of the island’s precipitation falls from June through August and, thus, clouds could obscure the eclipse. On the other hand, it make its longest landfall here, with nearly five minutes of total darkness, at 2:14 p.m. local time. Unfortunately, given the island’s limited services, virtually everything here is occupied. As the eclipse reaches the South American continent, it will first touch Chile’s southern coastline, but visibility is likely to be poor - this are gets the brunt of westerly Pacific storms and is often cloudy, and the center line passes through an almost uninhabited area. The Argentine side of the border, though, lies in the rain shadow of the Andes so, with a little luck, it could be clear and bright. There are no guarantees, though, and the weather will be significantly colder in Patagonia, where winter temperatures hover around freezing but, fortunately, the region’s legendary winds usually abate. The centerline will past over El Calafate, the gateway to the world-famous Moreno Glacier, so services should be abundant even though this is normally low season. At El Calafate, though, total darkness will last barely three minutes, and the sun sets only a few minutes later. Nevertheless, the town is gearing up for visitors and, according to my cousin María Elisa Rodríguez (who works as a tourist guide there), there will be 4WD excursions to the summits of surrounding hills for the best panoramas. For eclipse chasers with money to spare, a UK-based agency called Eclipse City will bring a chartered plane to view the event from 10,000 meters (about 33,000 feet) above sea level - where the eclipse will last about a minute longer - for the modest charge of US$2,000 per person. N(BA) Playoff Update: We Have Two Winners! Last Friday’s “Win This Book” contest has been resolved, as Dorothy Park of Puerto Montt, Chile, correctly identified the two Argentines on NBA playoff teams. 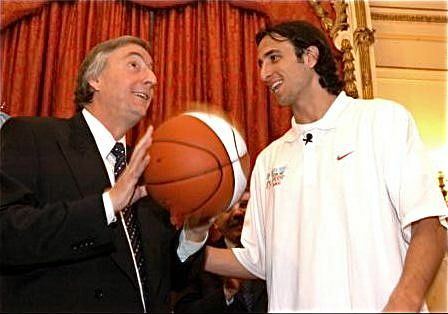 Emanuel Ginóbili of the San Antonio Spurs (pictured here with former Argentine president Néstor Kirchner) is a native of Bahía Blanca, in southern Buenos Aires province), while Carlos Delfino of the Milwaukee Bucks hails from the the city of Santa Fe, capital of its namesake province northwest of Buenos Aires. Meanwhile, Owen Lipsett of Scarborough, New York, identified the Washington Wizards’ Fabricio Oberto (of Las Varillas, Córdoba province) and the Houston Rockets’ Luis Scola (Buenos Aires) as members of non-playoff teams. In fact, Dorothy had answered this part of the quiz correctly as well, and also named the Sacramento Kings’ Andrés Nocioni (also from Santa Fe). For my part, I had overlooked Oberto who, with the others, would form a decent starting five, with Ginóbili, Scola and Delfino averaging in double figures in scoring this past season. They would be a little small by current NBA standards, though, with Oberto (primarily a backup center) the tallest at 6-foot-10 (2.08 meters). Scola is 6-foot-9 (2.06 meters), Nocioni 6-foot-7 (2.01 meters), and Ginóbili and Delfino both 6-foot-6 (1.98 meters). Ginóbili is by far the highest-profile Argentine ever in the NBA; with the Spurs, he has earned three NBA championship rings, in 2003, 2005, and 2007. His personal honors include making the NBA All-Rookie Second Team (2002-3) and the NBA All-Star Team (2004-5), being named NBA Sixth Man of the Year (2007-8), and making the All-NBA Third Team (2007-8). Last month, the Spurs rewarded his sustained excellence with a new three-year, US$39 million contract. In fact, Ginóbili also brought something new to the NBA: in his ability to draw fouls, both offensive and defensive, he has personified viveza criolla, which Anglo-Argentine journalist Andrew Graham-Yooll (an acquaintance of mine) defines as “artful deception.” In the sports world, the most famous case of viveza criolla may be soccer legend Diego Maradona’s “Hand of God” goal versus England in the 1986 World Cup. 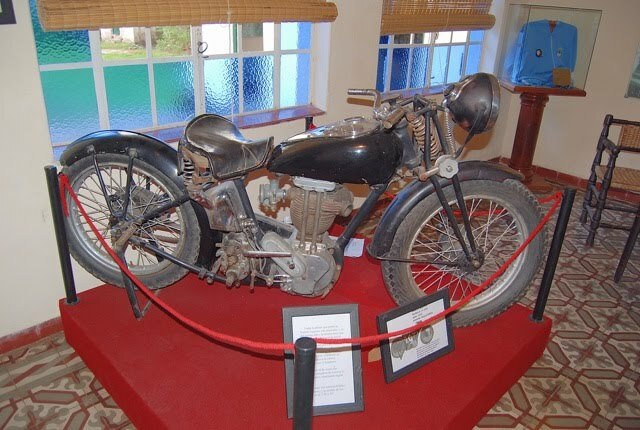 Artful deception is not exclusive to sports - my favorite example is the military museum director in Buenos Aires who ordered an inventory that found many valuable items missing that were later found in his garage. Ginóbili, though, probably learned it from playing soccer, where players clutch their knees in agony to try to draw a foul and then, more often than not, continue the rest of the match full speed ahead. To take off on a tangent, Ginóbili’s success may have led other sports teams to take a closer look at Argentine athletes. Recently my 15-year-old nephew, a softball pitcher in my wife’s hometown of Olavarría, went to Buenos Aires for a baseball tryout hosted by a scout for the Pittsburgh Pirates (a “small market” franchise, with limited financial resources, that may be looking for bargains). Nothing has come of it yet, and in reality it’s a longshot despite his size and athleticism - not to mention his limited experience and the relatively weak competition he's played against. Cuban and Dominican kids of his age have been playing tough competition almost since they could walk, and he’d have a lot of catching up to do even with the gift of raw talent. Win This Book - N(BA) Playoff Version! Argentina is known, rightfully, for world-class soccer, having won the World Cup in 1978 (at home) and 1986 (in Mexico, thanks in part to a questionable goal by Diego Maradona, coach of the national team for the upcoming World Cup in South Africa), but that’s not the country’s only sporting success. Polo is a comparable obsession in a country raised on horseback, and tennis has produced such stars as Guillermo Vilas and Juan Martín del Potro. Only recently, though, has basketball become a high-profile sport in and around the Río de La Plata. Argentine basketball's international notoriety rose dramatically with victories over the so-called U.S. "Dream Team" in the 2002 World Basketball Championships and the 2004 Olympics. Many observers admired the Argentines' selfless team play and at least one National Basketball Association (NBA) coach cited them as an example his own team should follow. Recently, professional basketball celebrated its 25th anniversary in Argentina. Buenos Aires has two teams in the first division of the Liga Nacional de Basquet: Boca Juniors (under the same ownership as the world-famous soccer team) and Obras Sanitarias. With arenas seating no more than about 3,000 spectators, basketball crowds are far smaller than those for soccer. The regular season runs early November to late March, with playoffs into mid-May. Meanwhile, the NBA playoffs continue and, to acknowledge the lengthy professional season here, I am offering a free copy of Moon Handbooks Buenos Aires to the first reader to tell me the names, and teams, of the two Argentines to play in the NBA playoffs this year (hint: only one of them is still playing, as the other’s team was eliminated in the first round). For second prize, anyone who can name the other two Argentines currently on NBA rosters with receive a copy of Moon Handbooks Argentina. Please send all entries directly to my personal email address in the header above, and not to the comment box. 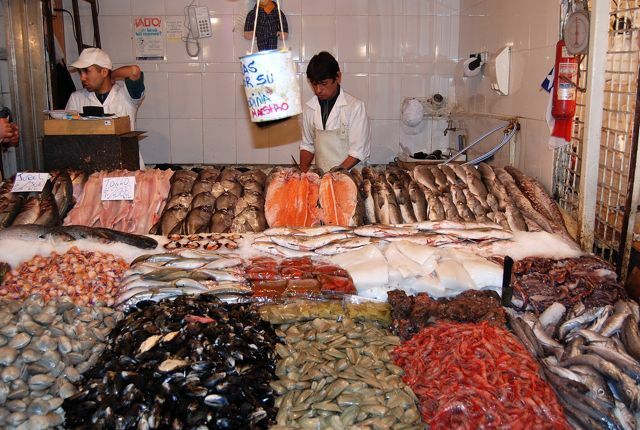 One of travel’s great pleasures is sampling foods that one can’t find anywhere else - such as the remarkable diversity of seafood on display at Santiago’s Mercado Central. When Texas food writer Robb Walsh visited the market some years ago, he marveled at “a display of fishes and shellfish so vast and unfamiliar that I felt I was observing the marine life of another planet.” Dating from 1872, the wrought-iron superstructure, decorated with the Chilean flag’s lone star, is the work of architect Fermín Vivaceta. When I first visited Santiago, in 1979, the market - only three blocks north of the central Plaza de Armas - was not exactly a tourist attraction. 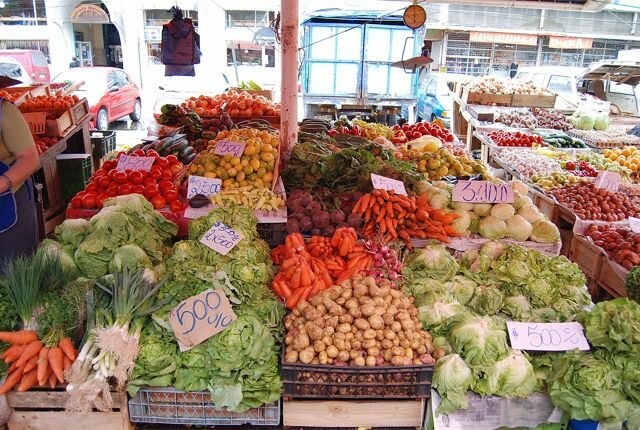 Neither was Chile, for that matter, during a Pinochet dictatorship that would last nearly another decade, but the market was still a gathering place where young Chileans would breakfast there after partying all night despite an 11 p.m. curfew (which gave them no alternative to partying all night in whatever place they happened to be). At the time, market restaurants such as Donde Augusto were relatively modest places with bargain prices for traditional dishes such as chupe de locos, an abalone casserole that’s harder to find these days as locos (as Chileans call their abalone) and other species have suffered overfishing. In the midst of the fruit-and-vegetable sector of the market, Donde Augusto and a couple other restaurants - whose prices have risen considerably - now dominate the food service, but the cheaper ones around the market's periphery are by no means inferior. Always closed by late afternoon, as it’s primarily a lunchtime destination, the Mercado Central remains an attraction for Chileans but it now draws many foreigners as well. If dining here, though, be sure to request your fish a la plancha (grilled) rather than frito (fried), and don’t overlook the typical ensalada chilena of tomato, onion and cilantro - not to mention a pisco sour - for one of Chilean cuisine’s simplest but most appealing combinations. Its proceeds intended to go toward earthquake reconstruction, the so-called “fat tax” would target foods with excess sugar, salt, and fat. The villains are the usual soft drinks and processed foods, including the products of international “would you like fries with that?” chains that have established themselves here over the past couple decades. 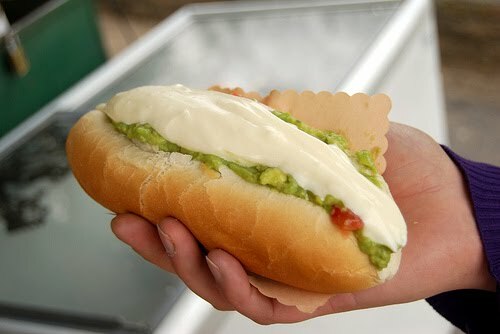 That doesn’t mean Chile doesn’t have its own unfortunate tradition here: sold at streetside kiosks throughout the country, the completo (photo courtesy of Paul Lowry) is a cheap mayonnaise-slathered hot dog, a caloric overload that carries plenty of everything that the new tax would attack.